HomeEmergency PreparednessShould You Buy Preps or Pay Off Debt? Should You Buy Preps or Pay Off Debt? A friend of mine confided that she had her credit card declined at the check out line as she was paying for bulk items at Costco. She is new to prepping and I had been giving her tips on starting a food storage plan. I felt bad for her – it is awful to get your credit card declined in front of a whole line of people. I had no idea she was deep in debt; it is not the sort of thing that is usually discussed with friends or family. I think many people are in denial about being debt, just as they are in denial about the need to prepare. It is unfortunate my friend was not able to get the bulk items just as she was getting started but I think she can start by prepping in small steps. When someone finally wakes up and feels the need to prepare, it is often accompanied by panic. Thoughts about not having enough money to get all the gear you think you need fill your mind, and these thoughts might make you even more paralyzed. How do you find money to prepare, while you are also trying to dig yourself out of debt? On one column, list your income. On the opposite column, list your expenses including rent or mortgage, utilities, food, gasoline then list your debts, and possibly savings. Your income less expenses should have a small amount left, and you can allocate that to prepping. I believe you can prep even if you start with $5 a week, as long as you do it consistently. I have seen advice or comments in other sites saying just run up the credit cards and buy all the emergency supplies even if it’s on credit. I’d stay away from doing making additional charges, because that just sinks you further and further into the pit of debt. In a year or two, if nothing happens, you will still be in debt and you will just blame yourself even more. It is hard to put the cards away, but that is the only thing that works. If you don’t carry it in your wallet, and it’s out of reach you are less likely to use it. Switch to using cash only. Try to get more money coming in. While technically not getting more money coming in, using coupons increases your stockpile at a lower cost. See Extreme Couponing. I encourage you to try out even just one project a month, and you will end up saving some money. I would say as long as you are current on your bills, and are able to set aside a small amount for water, food and emergency supplies, then you should do so. Having a small amount set aside for emergencies will help you avoid relying on credit cards then next time you need to replace a tire, pay for an emergency room visit or other unexpected expense. I also like the Surviving and Thriving blog by Donna Freedman, which features a bit of everything but also has some great advice about living well on a small budget. If you are new to Apartment Prepper, please check out the “Getting Started” tab and check out our Money Mondays for tips on improving your finances, saving money and increasing income. Being prepared for emergencies and having a small stockpile of your necessities will actually save you money in the long run. 25 Comments on Should You Buy Preps or Pay Off Debt? I noticed that you already linked to Dave Ramsey and that is a great place to start with his baby steps program. It’s simple and to the point. Is it tough? It can be if you are used to spending into oblivion or without care, but once you get into the paying off your debt lifestyle, it will become second nature. I just believe that you should always pay off your debt first. Hi Mike, I think Dave Ramsey’s system does work, and it does take a lot of commitment. Thanks for the comment! Costco does not take credit cards at physical locations. They only accept credit cards online. Your friend had a debit card with no money in their account. Hey mattd32, that is likely what happened. She had zero resource to pay for her cart, and that is because she is deep in debt. Thanks for the comment. Costco took AMEX cards only. They will continue to take them I believe up until March of this year (2016). Don’t know what they’ll accept after that. But I mostly use cash there anyhow. Hi Ray White, Using cash at Costco keeps me from going off budget all together. That and shopping with a list. Thanks for the comment. I think they’re changing to Citibank, the nice thing is I probably spend $100/week at Costco including gas, and I make enough cashback to pay for my Executive membership. I pay my card off every month though so I never pay finance charges. Since the hour is late for needing preps, if I was in her circumstance I would do both. I would figure out where I could economize, and with the extra money pay down debt (using debt snowball) and buy preps. One could allocate different percentages of the amount to favor paying down debt, as even $20 a week in preps is a good start, and more than what most Americans set aside for preparedness. I would split every tax refund check 50-50 between paying down debt and preps and if its a big check, use 50% to buy the Berkey filter, a gun, or grain mill. The sooner you purchase the big ticket prep items the better, but always face your creditors and pay something every month. Prepping is providing for yourself into the future and is a much better investment. Paying down your debt also frees you to do more investing for your future. If you deny yourself the restaurant meal, movie or gadget now in favor of paying off your debts, you can get into the habit of saving after you’ve paid off your debts. But don’t deny yourself and your future needs; set aside some preps at the same time, to cover yourself if things go south before you’re completely out of debt. Hi Berean Betty, those are definitely good suggestions that could help her. Now that it is tax time, a tax refund would help get a large ticket item as well as pay extra on the debt. Thanks for the great ideas. See if you can’t jump start your effort by using Craigslist to convert unwanted items to cash. Even a few extra bucks is movement in the right direction, whether to be used for prepping or for paying down debt. Hi Sideliner 1950, Selling items using Craigslist is a great idea to get some cash coming in, it’ll also help free up space for supplies. Thanks for the comment. Your friend should also look into her monthly expenses. Can she do without a cable subscription? If she is a renter, more affordable accommodations may be available. Perhaps her daily trip to Stealbucks could be curtailed for coffee made at home. Does she cook from scratch or buy ready to heat products? Most people don’t lose their money on big ticket items; it’s the small expenditures that add up. 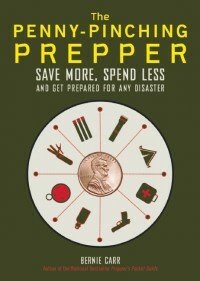 Often times, a good percentage of a paycheck is spent getting others to do what you can (and as a prepper, should) do for yourself, such as preparing foods. I have an uncommon suggestion: I don’t recommend a drastic shift in her habits. She should take steps slowly so she isn’t overwhelmed by the process. I’ve found that people who take drastic action end up burning themselves out. Hi Siege, That is so true, the little expenses add up to derail a budget. She definitely needs to cut back as well as change her habits. Thanks for the comment! My brothers 22-year old daughter (read about him in my post below) buys 6 Stealbucks coffees each week. That’s $30.00 for a few cups of coffee. When I mentioned that a coffee maker is $15.00 at Wally-World and she could set the timer to have a cup ready every morning, she got mad at me and told me to mind my own business. Stealbucks is a very good name for that place. LOL, Stealbucks.. that’s funny. $5 per cup is way too much. I go there so rarely I always get confused on which one is the small, medium or large, because they have tall, grande and something else. I only go when I have a gift card so it is more of a treat for me. While I think one should have a good plan in place I see so much effort put into saving, cutting costs, living frugally, stretching every dollar. Let me ask you this, do you think Dave Ramsey got to be a multi-millionaire by not going out to eat and stretching dollar bills? Or maybe he latched on to his passion and turned it into a multi million dollar endeavor and EARNED more cash. Granted I’m sure he is still quite observant with his spending habits but the point is we focus so much on one side of the equation. Why not find ways to increase cash flow, something that can’t happen overnight but in the span of 5-10 years could be quite significant. If you make $1000/mo and have $750 in obligations that’s a serious problem. If you make $5000/mo and have $1500 in obligations life is good. If you make $10,000/mo and have $5,000 in obligations there is definitely some tweaking that could be done but $5k in disposable income is nothing to shake a stick at. I’m just so tired of the lopsided mentality that is preached in the prepper community that we all have to live like hermits and be debt free. Seriously. Hi NotDaveRamsey, Agreed, increasing cash flow is the other side of the equation, that is why I advise getting more money coming in at the same time as cutting back. Thanks for the comment! I think getting out of debt should be your first prep. In my opinion, barring some truly catastrophic event like a massive asteroid impact or perhaps a Carrington style EMP, society is unlikely to collapse completely. That means you will probably still have a job, will still get paid, and will still be expected to pay your bills. Your debts will not simply vanish when TSHTF. Getting out of debt before that happens gives you economic freedom to pursue your dreams. That said, be sure to set aside some cash for emergencies and try to learn bartering skills. For example, in Argentina, which has suffered 80% inflation over the past two years, public utilities and public services are still operating. Water still flows from taps. Electrical power is still on. Food is still available in stores. Police, fire and medical services still exist–though I’m sure they are somewhat degraded. So Argentines are NOT in a WROL (without rule of law) situation. Cash is king, especially gold and silver, and there is a large underground economy based on barter. People who are in debt, suffer more than those who aren’t. Hi Ray White, Thanks for weighing in to this. Agreed, a complete collapse is not as likely as an economic crisis where services and society still function, but life is a lot harder. Appreciate the comment. I’m not in debt (a painful divorce 20-years ago) and will never be in debt again. There is no right answer to this as each situation and ones desires are unique and each persons assessment of what we may or could face is different. As is their desired living situation and comfort. Or at least what they see as comfort. As an example my brother has a much higher standard of living then I do. He has just about every toy you can imagine. But he works 18-hours a day 6-days a week. His standard of living is high, but his quality of life is what I would call very low as he works all day, every day. He’s been doing this for 15-years. He’s in debt hundreds of thousands of dollars and has been so for years, and always will be as he just keeps buying things. That would drive me nuts if I lived like that. I have a modest home and 12-year old autos. I buy everything with cash. I can spend a day doing nothing and not be pulled under like my brother would be if he stops paddling for even a day. I spent the day today listening to MP3’s while tinkering in the garage. I made zero money today and was as happy as can be. My quality of life is very good and stress free. My brothers quality of life, not too happy or good. As far as paying of debt or buying preps. I think we all should have a basic level of preps. I would say 3-months (6-months would be better) of food as a start. Buy this amount by slowly adding a few items to your shopping list every time you shop. Sell your bankers-dream auto and buy a few-thousand dollar junker that runs well even if it looks old. A bit of rust never hurt anyone. Once you have a basic level of preps I would say to start doing the Dave Ramsey thing. While I don’t like him personally, but his method seems to work for people in debt. I actually had a relative anomalously send me one of his books a few months ago, as they thought I needed it. I don’t look too prosperous when looked at from the outside and I’m not in debt a single dime. I have a few gold coins (only 4) and hundreds of ounces of silver put up in a safe, I buy a few ounces of silver each week, been doing it for 3-years. I have so much food I don’t really know how long it will last. I used 1,100 meals as a base for a year of food (3-meals a day) and I passed that up a few years ago. I have work van, motor home, small house, a PU-truck, lots of guns, tools to fix anything, welding, wood working, auto repair, home repair, I do it all and have done it without debt. I have my own home repair business and am as busy as I want to be. The relative that anomalously sent me the book is in debt with at least (a just-built in the last 3-months) $300,000 home with all new furniture and 2 new autos, lots of the latest electronic toys with the monthly bills. They have a Kindle & a Nook e-reader, a large I-Pad and 2 smart phones, why does a person need all those? I’m in much better shape then she is, but she is arrogant and can’t see outside her limited view of the world. She is the one that needs Dave Ramsey, not me. But it does tell me a good thing, my OSPES is in place and working well. So basically my view is to build a few months of preps and cut all expenses and pay off debt and don’t for any reason buy anything on credit. As stated above building more income streams will generate more income to service that debt and eventually buy preps. Hi Chuck, I agree that having all the trappings and status symbols does not mean anything if the person has a lot of debt. I would prefer a higher quality of life and the freedom to do what you feel like instead of having to work so hard because of debt. Good for you, being debt free, but having your comforts and a good amount of preps. I’d much prefer looking low-key and having what you need. I had read The Millionaire Next Door a few years ago; you don’t have to look prosperous to be “rich” Thanks for weighing in on this subject that I am sure a lot of people are wondering about. Anyone that has Netflicks and wants to save money can dump it and go to http://www.putlocker.is and watch movies and TV shows for free. Hi Chuck, I had not heard of that-thanks for the link! Getting rid of debt should be the top priority but that doesn’t mean you can’t prep nor does it mean you have to live like a pauper. I filled 2L pop bottles with tap water which I change out twice a year. I read grocery flyers every week and plan meals around specials which allows me to buy a few extra cans or packages for food storage. I watch for caselot sales and use some of my food storage that week for meals so as to take advantage of the sale. I found my FoodSaver for $5 at a garage sale. A lot of my first aid kit is from the dollar store bought one or two items at a time. Watching you tube videos to learn a new skill is free so is regular walking to improve overall fitness. Hi Susanne, These are all great tips-thank you for sharing them!